Got a bunch of people, a big open space and nothing else? How about a round of Kabaddi? Kabaddi is a game of speed, strength, strategy and, most importantly, lungpower. First you’ll need twenty-four people split into two teams of twelve. Only seven players per team are on the playing field at the same time. The remaining teammates are reserves that can “sub in” later. The two teams go to opposite sides of the field, which is divided in two equal sections. Flip to see who goes first. That team starts out on offense and the two teams alternate offense/defense each turn until the game is over. Here’s where it gets interesting. The offending team sends out their “raider” to the enemy side of the field, where he must try to touch as many opposing teammates as possible before returning safely to his side of the court. The catch? He must do all of this while yelling “Kabaddi, Kabaddi, Kabaddi, Kabaddi…” repeatedly and in one long breath. And the best part is: we’re not making this up! This is a REAL SPORT! If he makes it back to safety in one breath, everyone he tagged has to leave and the offense gets a point for each of them. In addition, they may “revive” a teammate that was previously tagged out for each enemy that gets the boot. If the raider doesn’t make it back, the defending team gets a point and the raider has to leave the field until he can be “revived”. If a team succeeds in getting the entire other team out, they score a “lona” and get an extra two points. Play then continues by putting all players on both sides back on the field. The team with the most points after two 20-minute rounds wins the game. Of course the defenders try to hold the poor raider down so that he runs out of “Kabaddis” on their own turf. These larger chaps are known as “stoppers”. To make things more interesting (and fair) each team can only have four stoppers on the field at once, and only one stopper can try to stop a raider at any given time. Other current variations of the game thrive throughout the world today, including a version called “Gaminee” where players can’t be revived. Instead the game is over when one of the teams is completely wiped out. As for the game’s history? While there are no actual records anywhere, there is apparently concrete evidence somewhere that suggests Kabaddi was developed about 4000 years ago to help Indian soldiers develop their self-defense skills (not to mention their pronunciation of the word Kabaddi skills). Today the game is played worldwide. 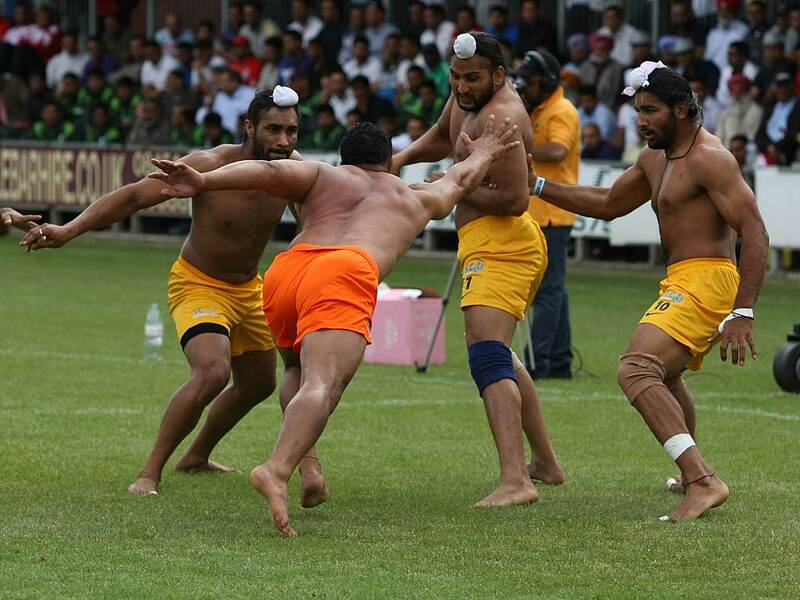 (Yes, there’s an American Kabaddi team.) There’s even an official Kabaddi organization, the Kabaddi Federation of India (KFI), founded in 1950 that regulates play and rules and keeps a bunch of records and stuff. Not ready for the big leagues? Try the Amateur Kabaddi Federation (AKFI). The 2013 International Kabaddi Cup tournament was held at Princes Park so I went along. Here’s a clip of the televised action. Video streaming by UstreamI got the gist of the action and it was quick and dynamic. The idea seems to be to send a ‘raider’ to the other team’s half of the circular area and tag one and return to the centre before running out of breath – saying ‘kabaddi, kabaddi, kabaddi’ over and over. The other team attempt to stop him from returning and hold him back until he runs out of breath. A sort of mixture between rugby, wrestling, sprinting. I red your article is very interesting. Kaabadi is one of the Indian Game. Tamilnadu is the State is Origin of Kabbadi. more-than 2000 years rich culture in Tamilnadu. we are playing Kabbadi. Kabaddi is a contact sport that originated in Tamilnadu (India). Kabaddi is an umbrella term which encompasses various forms of the game including International rules Kabaddi, and the Indian Kabaddi styles – Sanjeevani, Gaminee, Amar and Punjabi. Kabaddi also encompasses similar sports known by their regional names, such as hadudu in Bangladesh, baibalaa in Maldives, chedugudu in Andhra Pradesh, sadugudu in Tamil Nadu and hututu in Maharashtra. Kabaddi is the national game of Bangladesh and also the state game of the Indian states of Tamil Nadu, Maharashtra, Bihar, Andhra Pradesh, Telangana and Punjab. India is the most successful team on the world stage, having won every world cup and Asian Games title so far, in both men’s and women’s categories.